For larger amounts of mail, filing or correspondence, we build a wire mesh frame as shown here and mount it onto our standard TS/065 trolley. 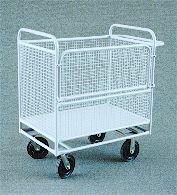 This gives a very strong, light and maneuverable trolley capable of carrying heavy loads over most surfaces. The six compartment model has openings on the side and a 200mm deep sorting tray on the top. Each side shelf slopes towards the back of the compartment so that files do not fall out while it is being wheeled. 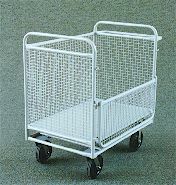 If a trolley is required to different dimensions, a trolley can be built in a similar way with its own base as shown in the photo. We have built other versions of the same idea as shown above where different numbers or sizes of compartments are required. Another common configuration is nine compartments as shown here. In this case, the top basket depth is reduced rather than increase the overall height and therefore make access difficult. Provision can also be made to carry long items such as maps or a support frame to hold a mail bag could be added. A different style of correspondence trolley is the three compartment type as shown here. This is designed for handling larger amounts of the same type of files. 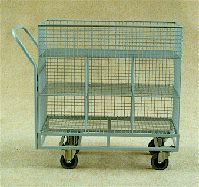 It has a large sorting tray on top and two large bins underneath that open towards the handles and slope down towards the middle of the trolley. It is constructed with a strong tubular frame and 25x25x3mm mesh panels. It is fitted with four swivel 125mm castors to allow it to be moved in any direction, making it easy to park beside a desk or table while in use or it can be pushed into a corner out of the way. 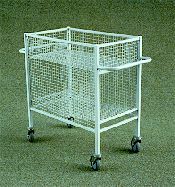 The wire bin trolley is a large capacity, medium duty wire mesh bin with a timber floor. It is made up of a tubular steel frame with wire mesh sides and a 16mm melamine floor. The floor of the bin is mounted high to reduce bending when loading and unloading. It has 200mm castors (two fixed and two swivel) which makes handling very easy even when fully loaded. The standard design has half of one side made to fold down or if required, it could be built with both sides folding. Another alternative would be to make the entire side panel removable. One other feature of the trolley is that the staka-nesta crates can be suspended by their rim across the width of the trolley giving a small parts bin for jobs such as order picking.